You might not be suprised to see another pie review with the word horse in the title after the supermarket meat origins fiasco. But neigh, we are not horsing around again, this time the pie did not actually contain horse (that we knew of). It was just the famous Big Plate Special from the popular low cost pub chain Hungry Horse (Royal Oak, Gloucester). 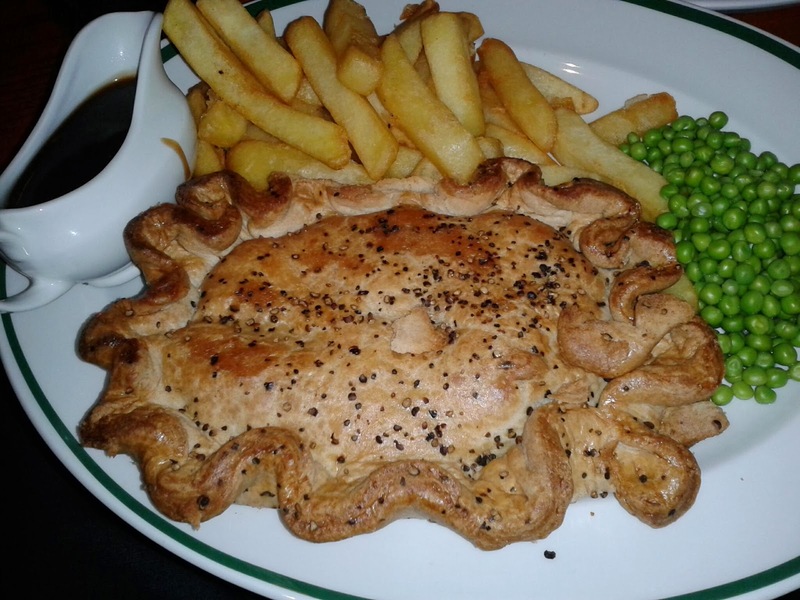 There is just the one meat pie available, the BIG Cornish Cow Pie. I was lucky enough to visit on a Tuesday which meant I got a free starter with my already cheap £7.99 meal. When the pie arrived I was shocked. This was literally the biggest pie I have ever been served in a pub. It was twice as big as a regular pie. You will be thinking now that this is an incredible achievement, how do they manage sell such a big pie at such a low cost. Well I will let you into a little secret here. I think they probably do it by absolutely not compromising their philosophy of providing something completely devoid of quality. It's my suspicion that they get whatever meat they can and grind it up so small that you don't notice it is chewy. I could go as far to say as I think hungry horse have come up with the fantastic concept here: if they make their pie filling an almost liquid consistency then their customers are saved from the horrendous effort of mastication completely (!). Another stroke of genius from Hungry Horse is to make the filling taste, in my opinion, like a Cornish Pasty and hence they can call it a Cornish cow pie despite it having having nothing to do with Cornwall. Hungry Horse have also decorated their pie impressively with, what seems to be in my view at least, a non-edible pastry substitute. I refer to the crimped pastry-like decoration around the edge. This is quite clever because it makes the pie look bigger than it is! It does look quite realistic, almost like real pastry, I was quite impressed. So hopefully by now you can tell how much I enjoyed eating this pie, however, unfortunately there was a downside. I was quite pleased to have eaten nearly all this pie and was still just about able to walk home. But then, much to my surprise, the pie decided that it was not going to be defeated that easily and I promptly threw it up again! Obviously I can't definitely say it was the pie which made me sick, but unfortunately this episode means the pie looses a significant number of points. 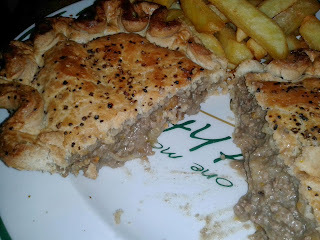 So in summary, this was a pie that I would only recommend if you are really hungry!